Oct. 11, 2018 — In the aftermath of Hurricane Michael, NOAA’s Office of Response and Restoration is reviewing early imagery to begin identifying potential pollution sources, such as displaced vessels and containers. An overflight image of a sunken ship in St. Andrews Bay near Panama City, Florida. The Florida Panhandle got the brunt of Hurricane Michael's impact as it made landfall yesterday. Image credit: Bay County Emergency Operations Center. Hurricane Michael made landfall near Mexico Beach, Florida yesterday as a Category 4 storm with winds of 155 miles an hour. Water levels at NOAA’s tide gauge in Apalachicola, Florida, broke the 2005 record set by Hurricane Dennis with a recorded 7.72 feet above high tide. 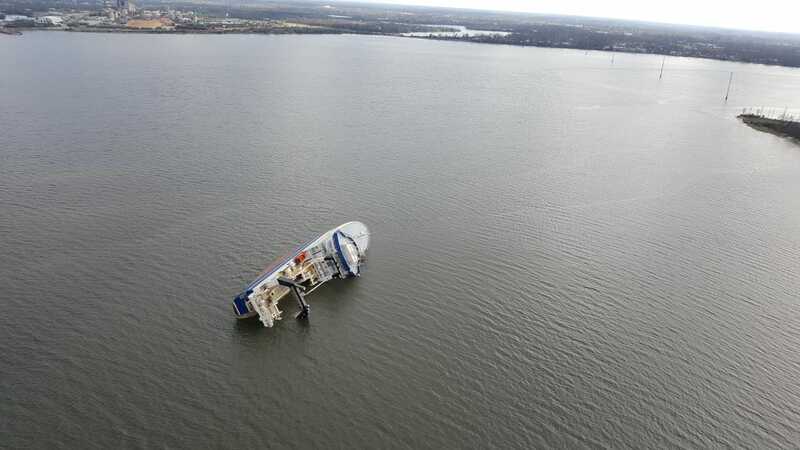 Though the full impact has not yet been evaluated, the hurricane-force winds and storm surge have caused significant damage and there have already been several reports of displaced, overturned, or capsized vessels. OR&R’s Gulf of Mexico Disaster Response Center, located in Mobile, Alabama, is currently providing office space and support to the Coast Guard and National Geodetic Survey. All OR&R staff working in the areas impacted by Michael are accounted for. The U.S. Coast Guard established an incident command post in St. Petersburg, Florida on Tuesday in advance of the storm. At this time, OR&R has not been activated for response and is standing by at the ready to deploy when the time comes. Early imagery is being ingested into OR&R’s Environmental Response Management Application (ERMA) — a mapping tool frequently used as a common operating picture by NOAA, the U.S. Coast Guard, and other response agencies. NOAA and the Environmental Protection Agency have already identified regulated facilities, including commercial and industrial facilities and Superfund sites, that lie in the affected zones. Having barreled its way through the Florida Panhandle, Michael is now moving northeast through the Carolinas as a tropical storm. According to the National Hurricane Center, Michael is headed northeast at approximately 23 mph and is expected to continue at that rate with an increase in forward speed throughout tonight. The center of the storm will continue to move across central and eastern North Carolina today before reaching Virginia this evening and continuing on to the western Atlantic ocean. OR&R is continuing to staff the North Carolina incident command post for pollution task force operations for Hurricane Florence. That area may see additional flooding from the remnants of Hurricane Michael over the next few days. To stay up to date on Tropical Storm Michael's movements, visit the QuickLook here.